This method is not necessary if you use Outlook 2010 or Outlook 2013. In Outlook 2010/2013 you can hit Reply to All then copy the addresses from the To and CC fields and paste into the members field of a Contact Group form (DL). You can use any list of email addresses to create a DL (or Contact Group), including from Excel or a custom view in Outlook (with only the display name and email address visible.) The only requirement is that each member's information needs to be delimited with a semi-colon or paragraph mark (one name and address per line). If there is not a display name, the address will be used for the display name in the finished DL. While you can get the addresses from any semi-colon delimited or one address per line list, this page was originally written to help people who wanted to create a DL from addresses in a message they were CC'd on. The instructions to create the DL once you have the list of addresses is below. Click in the header field of the Message options dialog and press Ctrl+A to select all, Ctrl+C to copy. Open a new message form and paste the header into it. I press Ctrl+A to select the signature then Ctrl+V to paste over it. Delete the content below the addresses and above it. Remove the text "To:" "CC:" and "From:"
Use Find and Replace to replace the commas with semi-colons and tabs (^t) with a space. If a name and corresponding address are on different lines, backspace to remove the paragraph mark. If you aren't sure, Ctrl+Shift+8 to toggle marks on and off. Or use Find and replace to replace paragraph marks (^p) with spaces. These screenshots are from Outlook 2010 but the screens look similar in other versions. Enter a name for your group in the Name field then click Save & Close. The steps to do this in the older versions of Outlook are basically the same but the labels may have changed. Enter a name for your list then click Save & close. This video tutorial shows you how to get addresses from the header of a message in your Inbox and create the distribution list. This will work in all versions of Outlook except Outlook 98/2000 in Internet Only mode. In older versions, paste the addresses into the Add to Distribution list box on the right side of the select names dialog. You can also do this to method create distribution lists in older versions of OWA. Where do I find the 'contact group form'? It depends where you are in Outlook and which ribbon - the old one or the new simplified ribbon. :) Keyboard shortcut is Ctrl+Shift+L and should work from any folder. If you are in Contacts, it's either a button on the ribbon or at the bottom of the New Contact menu - it's New Contact Group. If you are in another folder, it's under New [item] > More Items > Contact Group. 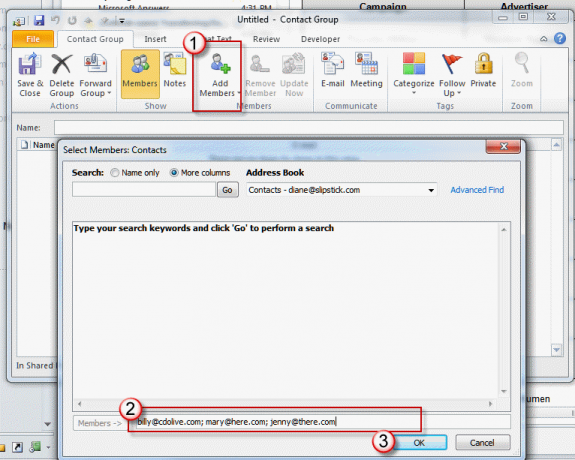 6 contacts folder, one for each of your email accounts? Are the accounts configured as pop3 or imap? If pop3, create a new folder in the data file the account is delivered to (right click on a folder, choose New folder, then select Contacts as the folder type and the folder you want as a parent folder). You can do this with imap, but the folder won't be synced or backed up and you risk losing the contacts. If account is new(without any contact or email been sent/received) and we want to paste all the IDs to this new accounts' contact list, then how would we do that? I don't want to go through the route of filling up a long form to add each of the contacts. I am talking about Outlook's latest version. i use it on IE browser. Unfortunately, adding people to a group in a browser requires you have a contact for them. Only outlook on the desktop can add a list of addresses to a contact group. Sorry. ETA: if you do it in outlook, the group syncs up to the server so you can use it online. Thank you very much. You were very prompt. I am using Outlook 2013. I am trying to add a group listing of emails I received as an attachment ( it was their group) to my group listing. How do I add this group to my contacts? if it's an outlook contact group, just drag it to the contacts folder. if it's a text list of the addresses, one per line, copy them and paste into the members field of a new contact group. When I send email will the other email addresses appear or will it only show addressee's email address? It depends where you put the addresses or group name - if you put it in the BCC field, recipients will not see other names. If you put in it the CC or To field, they will see other addresses. I'm using Microsoft Outlook 2010. I created a contact group without using email addresses. I want to change the names, such as add/remove a title of the name and cannot edit them in any way. Can anyone help me, please. I do not want to retype all of the names again and I don't want them as contacts in my email contact list. Remove members you are editing from the contact group - outlook will skip entries that have the same email address so you can either remove all of the members or just the ones you are editing. Make changes in the list in notepad then select all, copy - back in the group click Add members > From outlook contacts. Paste the list in the members field. I forgot the second method - open the group, use forward, internet format. Open the text field, remove the stuff above the first line and edit as needed. Getting the address list this way is a little neater - it's easier to read and edit. Remove the people you are editing from the contact group and paste the list in the members field after editing.